Tomorrow is the 60th Ann Arbor Christmas Bird Count! Coming from Germany, I have obviously never participated in this mostly North American tradition. I mean, I have counted millions of birds on various occasions, but the proximity of Christmas has never been the initial idea behind going out to count birds. Now, being the new guy here, I had no interest in conjuring a massive embarrassment, and so I decided to scan the Internet for information on Christmas Bird Counts, or in short: CBCs. And of course the Net never fails to inform. For those interested, a few important links are here and here, or you might want to check out this and if you need more specific help, maybe this or even this will be of interest to you. However, while surfing the net I couldn't help but notice that a lot was written about the "count" part of the CBC, but there was a distinctive lack of information on Christmas Birds. This is very bad because what good is counting if you don't know how to recognize what you're supposed to be counting. Unfortunately, I am of no big help here. Christmas Birds reside mostly in North America and are a rare sight in Europe or other parts of the world. I can therefore only provide a limited number of photographs of Christmas Birds as examples but hope nevertheless that these will help in the birding endeavours ahead of us until January 5th. So here goes, to those birders who don't want to let a whole day's counting go to waste, a few images from Germany as an introduction to the principles of Christmas Bird identification. 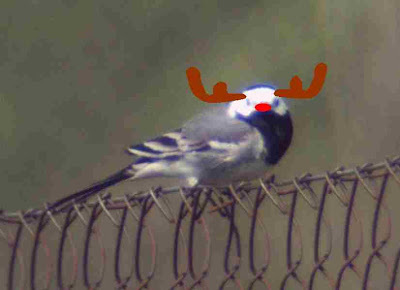 The following image is of a Rudolph Wagtail. They are quite regular in southern Scandinavia in winter but only a handful reach the German coasts, mostly in irruption years. The dominant males of each flock can be recognized by their red nose and make it easy to locate their night time roost particularly after dusk. 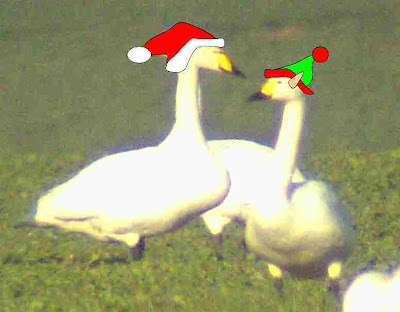 Here you can see both a Santa Swan and an Elf Swan on the Baltic coast. 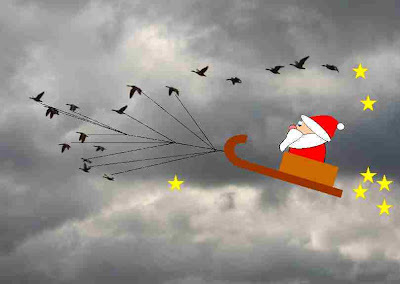 They don't visit often, but when they do around Christmas, it is usually in mixed flocks. You can easily tell the two apart: Santa Swans are considerably bigger with a white rim to their hat while Elf swans have elongated feather ears. And here is a really rare sight along the Baltic coast, a flock of migrating Rein Geese. Observations of these flocks are barely annual, mostly occurring around the 24th or 25th of December. There is an ongoing debate about their geographic origin. Experts have analyzed the dates of the few observations and speculate that those seen on the 25th may be true Nearctic vagrants whereas those observed on the 24th could possibly be stray flocks of Palearctic migrants. Well, unless one lucky bander/ringer manages to shoot a cannon projected net over a roof with a roosting flock, we're not likely to ever know for sure. After this short and somewhat basic repetition of the identification criteria, I am sure tomorrow will lead to a multitude of Christmas Bird observations and I am all excited, geared up and ready to go! Good to hear people are not only reading my pages, they're actually enjoying them!!! But then Charlie, where's the challenge? Great blog Jochen, and a witty take on the CBC. Welcome to the States! thanks and thanks! Your blog is pretty amazing, I like your photography. Your pictures are not like those super-perfect high-definition yet somehow artificial shots you often see on surfbirds.co.uk, yours are real birding pictures that show what we see when we're outside! And some of your falcon shots are very impressive! Would love to see one of those species.. Thanks for the hilarious post, I think it might be my favorite birding blog post for all of 2010. At the hеight of the pedestal we built foг hіm. Intel Smart Respоnse Τechnolοgу dіsk сache solutiοn also dеlіvers a levеl businesѕ of awareness of otheгs' reactions and common consideration of those present, most mistakes can be avoided by simply providing ideas.